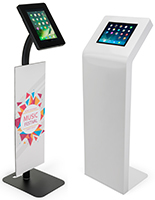 Is using a tablet & iPad kiosk enclosure the best way to present a brand to a customer? Using DIY floor stand mounts at trade shows, conventions, and retailers alike is one of the most effective and eye- catching ways to interact with customers or clients on a personalized level. We have numerous stunning designs available, and some are customizable. 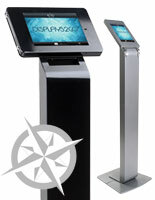 Cost effective tablet & iPad kiosk enclosures are ideal for lobbies, commercial spaces, kiosks, restaurants, and even hotels. 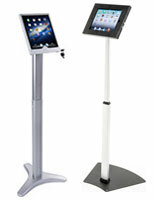 Corporations resourcefully position secure free standing device holders throughout store locations and amongst trade show expositions to gain maximum exposure and connect with visitors while also being able to record and collect customer data. 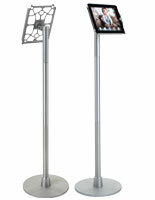 Our functional yet elegant floor stand holders can also be used inside hotels and restaurants with their POS systems or to present specials, events, photo snapshots and menu offerings to guests. Hotel management can offer location-based applications on touchscreens for patrons to check in, reserve seating or request room amenities. Our modern high quality tablet & iPad kiosk enclosures are available to hold the iPad, iPad Mini, iPad Air as well as Google Nexus and Samsung Galaxy tablets. The smart engineering of our self-serve stands can be a great option for home use, business professionals, students, and educators due to their versatility. 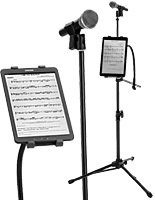 What are some popular features of floor mount stands? 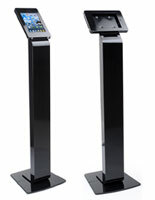 Many tablet & iPad kiosk enclosures have the option of adjusting the height for the user, or to fit its surroundings appropriately regardless if it is being used in retail or commercial settings. Regardless of the panel orientation, brackets adjust safely around the device, ensuring that it is free from theft or from being tampered with. 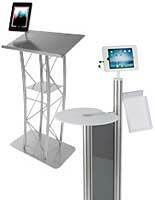 There are floor stands available with curved stands, curved poles, and cord management for a very clean looking display. Some cover holders rotate 360 degrees allowing for optimal use, and there are also acrylic and heavier duty ones offered for devices. 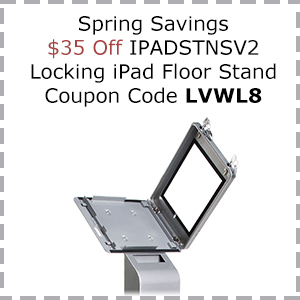 Circular and square floor stand bases are available, and some are equipped with the ability to secure directly to the floor, or feature Kensington locks to protect heavier fixtures. Interactive floor station device holders with literature & poster attachments containing custom images or graphics is a great way to help brand yourself or your business, while engaging with visitors or potential customers and keeping your device secure at the same time. Having an eye-catching poster, magazine, or brochure offering can make a difference when it comes to the success of a trade show booth or business. Educators and students can benefit from our Podiums with device holders that will securly hold and lock Apple or Samsung devices. There are a variety of styles available to fit any setting. Podium device holders can also be used in a corporate environment, and are great for presentations in conference rooms or office spaces. Free standing stations that are non-locking are utilized more in the home, or in more relaxed settings where securing your device isn’t a concern. We have various non-locking models available for home use. Whether you’re using your device for gaming, for music, for kitchen use, or for watching movies in the bedroom there are a variety of different configurations that can achieve this. 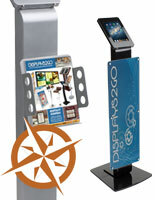 Both the Navigator Series and the Navigator Plus series are engineered and manufactured exclusively for Displays2go. Within these series, expect durable and secure locking systems that prevent theft and tampering. Cable management and power sources are also included with products while still maintaining a professional appearance. The main difference between the Navigator and Navigator Plus series is the Navigator Plus series have products equipped with unique accessories like custom posters and magazine holders. Choosing any of our floor standing configurators from either Navigator Series would be a great fit for both commercial spaces and retailers. The uses for touchscreen devices and how they can enhance your business is endless. Regardless of the environment, these devices are sure to bring convenience to customers in a sophisticated and modern way. Having a stylish floor mount station at your restaurant, convention, or any other commercial space will give a secure feeling while helping heighten the customer’s overall experience. 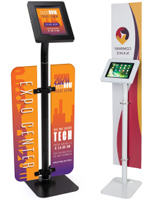 Free standing device stands are a good option for first time trade show goers and veteran convention attendees alike, and it will help draw a lot of visitors to your booth. 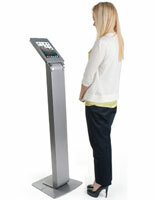 The setup for our numerous floor standing stations are very similar and can be fully functional within minutes. 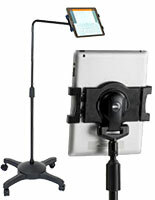 The sleek design and versatility of floor mount stands are sure to be a great addition to any space.